Even during the following morning we found the waves still a bit rough. We could not even get off on Camara since the beach area where boats usually dock was buffeted by strong waves. We would finally get to visit this island four years later - during a Holy Week break. Camara Island comprises two large rock islets connected by a strip of white sand bar that disappears at high tide. The surrounding waters are a pleasant emerald green. Huge rocks are scattered across the island. You can go beach combing and snorkeling here but since the island is relatively small there is little else you can do except to take pictures. White sand beach on the eastern side of Capones Island. From Camara, our boat continued on to Capones Island, another island with big rock formations and boulders set against high cliffs. There is little soil here so vegetation is sparse. 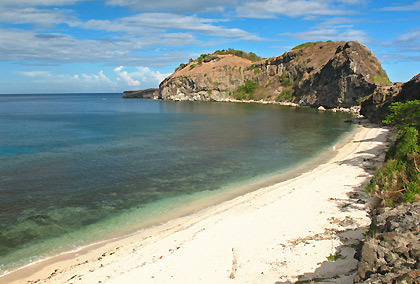 Capones is surrounded by a number of white sand beaches. The best stretch of beach for us is located on the eastern side. 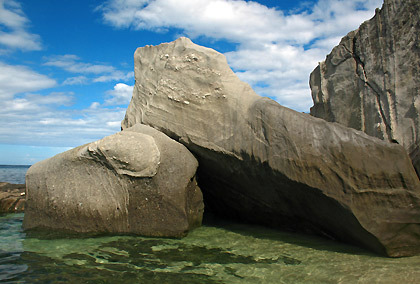 This particular beach features huge, stunning rocks and boulders and is also a good place for swimming and snorkeling. You can find a good number of fishes swimming among the rocks. We also climbed the hill just beyond the beach to be rewarded with a really nice panoramic view of the crescent-shaped beach below. Capones offers a lot of excellent photo opportunities. 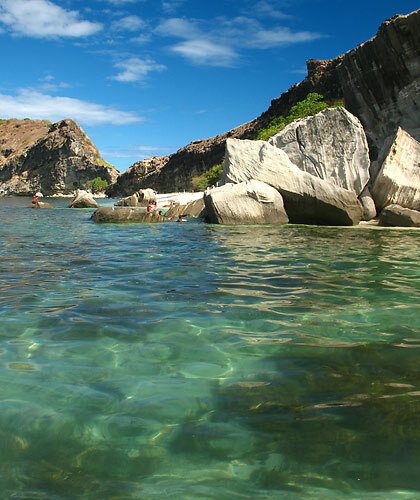 It is best to go to Capones and Camara Islands during the summer months of March to May when the waters are calmer. (By the same token there are more visitors during those months.) Both islands are visible from the beach at Pundaquit and just 15 to 20 minutes away by boat. The two islands are 3 kilometers away from each other. 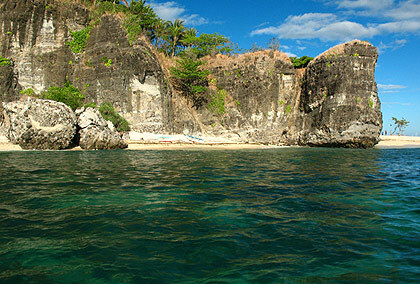 Most visitors include Anawangin Cove on their itinerary, and perhaps possibly the more distant Nagsasa Cove. One request when visiting Capones Island from this shoestring traveler couple though: please do your best to keep the island clean. We were disappointed to find a considerable amount of thrash strewn about at certain spots in the island. Let’s try to preserve the island’s beauty for generations to come.